Panevėžys ([pɐn̪ʲɛvʲeːˈʒʲiːs̪], Polish: Poniewież, Yiddish: פּאָנעװעזש‎ Ponevezh) see also other names, is the fifth largest city in Lithuania. As of 2011, it occupied 52 square kilometres (20 sq mi) with 113,653 inhabitants. The largest multifunctional arena in Panevėžys, Cido Arena, hosted the Eurobasket 2011 group matches. Panevėžys was first mentioned in 1503, in documents signed by the Grand Duke of Lithuania Alexander I, who granted the town building rights to construct a church and other structures. Alexander II is considered the founder of the city, which celebrated its 500th anniversary in 2003. The city lies on the old plain of the Nevėžis River. The city name means "along the Nevėžis." Throughout the 16th century, the city maintained a status of a Royal town. Communities of Poles, and Karaites, settled in the area as early as the 14th century. A Karaite Kenesa, and a Polish Gymnasium, existed in Panevėžys until the Second World War (the Polish version of the name of the city was Poniewież). In the 17th century, the part of the city on the left bank of the river started to develop and expand further. The town played an important role in both the November Uprising, and the January Uprising, and the fights for independence continued there in 1864. After the Industrial Revolution, at the end of the 19th century, the first factories were established in the city, and industry began to make use of modern machinery. As products were oriented towards the mass market, banking intensified and commerce increased. The educational system became more accessible, and literacy increased, as well. By the end of 19th century - the beginning of the 20th century, Panevėžys became a strong economic and cultural center of the region. At the time it was the fourth most important city in Lithuania. It was also a center of operations by local knygnešys. One of them - Juozas Masiulis - in 1905 opened first Lithuanian bookstore and printing house. The building is still a landmark of Panevėžys, and local people are proud of a bookstore that has been functional for more than 100 years. Between the World Wars, in the newly independent Lithuania, Panevėžys continued to grow. According to the Lithuanian census of 1923, there were 19,147 people in Panevėžys, among them 6,845 Jews (36%) (in Yiddish the town's name was פוניבעזש, transliterated as Ponevezh). The Ponevezh yeshiva, one of the most notable Haredi yeshivas in the history of the Jews in Lithuania, was established and flourished in the town. Rabbi Yosef Shlomo Kahaneman (1886–1969), was its rosh yeshiva (head) and president. Known as the "Ponovezher Rov", he was also the leading rabbi of Panevėžys. He managed to escape to the British Mandate of Palestine where he set about rebuilding the Ponevezh yeshiva in Bnei Brak where it still exists in modern Israel. It has a very large student body of young Talmud scholars. The town's population rose to 26,000 between 1923 and 1939. On 15 June 1940 Russian military forces took over the city, as a consequence of the forced incorporation of Lithuania, into the Soviet Union. A number of political prisoners were murdered near the sugar factory. A large number of residents were exiled to Siberia or suffered other forms of persecution. After Germany attacked the USSR, Panevėžys was occupied by German forces, as it had been in the First World War. It acquired the status of a district center ("Gebietskommissariate") within the Reichskommissariat Ostland. During the Nazi occupation nearly all the Jewish population of the town was killed in 1943 during the Holocaust; only a few managed to escape and find asylum abroad. The major massacred was in August 1941 when 7,523 Jews were executed by Germans helped by the local Lithuanian police. In 1944 the city was yet again occupied by the Soviet Union leading to a new wave of political exiles and killings. After World War II, the natural process of the city's evolution was disrupted. The Soviet Communist Party, exercised dictatorial control, and the city was transformed into a major industrial center. During the 1960s and 1980s, several large-scale industrial companies were established. The Soviet authorities also destroyed the old town and only after protests by local people was total destruction of the old city center stopped. The number of inhabitants increased from 41,000 to 101,500 between 1959 and 1979. In 1990, the population reached 130,000. After Lithuania regained its independence, the city’s industry faced some major challenges. For some time it was regarded as a place where plastics cooperatives were making large profits. A suburban region, called Plastic Kings Castles by the locals still remains from that era and contains very big and sometimes bizarre houses. After independence, the population of Panevėžys fell somewhat and for a while most investments went to Vilnius or Klaipėda instead. With the economic growth in the early 2000s however, investment reached Panevėžys. Babilonas real estate project, the largest such project in the Baltic States with an 80 ha land area, has been developed in Panevėžys since 2004. 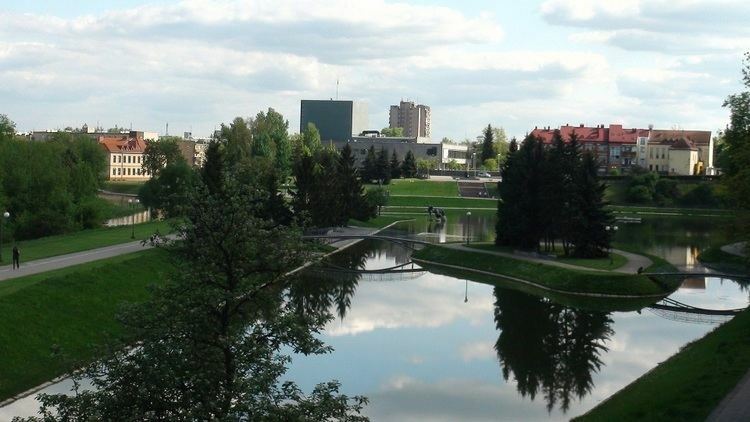 Panevėžys is situated in the middle of Lithuania; it is halfway between two Baltic capitals - Vilnius and Riga. The good geographical location with good road infrastructure, and the international highway Via Baltica provides opportunities for business. The city is connected by railway to Šiauliai (Lithuania) and Daugavpils (Latvia), as well as with Rubikiai/Anykščiai and Biržai by narrow gauge railway. This railway is preserved as a historical monument and serves as a tourist attraction. 6 km (3.73 mi) east of Panevėžys the Panevėžys Air Base is located. Panevėžys, situated in the centre of Aukštaitija, is sometimes called the capital of the region. It is a municipality on itself (Panevėžys City Municipality) and is also the capital of Panevėžys District Municipality, and Panevėžys County. The coat of arms with the red gate was adopted and formally approved in 1993. The Museum of Ethnography has accumulated a lot of artifacts of historical and cultural heritage. The Art Gallery organizes about 20 different exhibitions every year as well as music and literature evenings, lectures and discussions about culture and art research. The Photography Gallery arranges 30 exhibitions of photography every year. 10 photo artists had personal exhibitions abroad and won international awards. The Public Library has 8 branches. Since 1989 Panevėžys has been organizing International Ceramics Symposia. The unique collection of ceramics is the biggest in the Baltic countries and is added to each year. The Chamber orchestra, Women's Choir "Golden Oriole" (Lithuanian: "Volungė"), ensemble "Muzika" (Lithuanian: music) are well known for various music projects not only in Lithuania but also abroad. The Brass Orchestra "Panevėžio Garsas" (English: Panevėžys Sound) plays not only for Lithuanian audience but also for people in the Baltic countries, Germany, France and the Netherlands. The Orchestra won the Grand Prize in a festival in France in 1997. The city is a home to many theaters. Juozas Miltinis Drama Theatre is famous in Lithuania and Europe. Juozas Miltinis has brought up a number of actors. One of them is Donatas Banionis who is known internationally. Theater "Menas" (English: art) was established in 1991. The city boasts of Puppet Wagon Theater which is the only in Europe. Antanas Markuckis, the director of the Theater was awarded International Prize of Hans Christian Andersen in Copenhagen in 2003. Every two years the theater organizes the International Theater Festival "Lagaminas" (English: suitcase). There also is a musical theater and school called Juozas Miltinis school where are drama lessons lectured. FK Ekranas, winners of the Lithuanian Football League in 2008, 2009, 2010, 2011 and 2012, was based in the town before it went bankrupt in 2015. After FK Ekranas bankruptcy the strongest football club is FK Panevėžio Panevėžys which is playing in Lithuanian first division 1 Lyga. BC Lietkabelis, one of the clubs that established LKL and is playing in it since its inception, is also based in Panevėžys.